Home / How Much Do Dental Veneers Cost in the UK? Dental veneers are ultra-thin, translucent pieces of composite resin material or porcelain (ceramic) shells, which are affixed permanently to the front of the teeth using special glue in order to create instant perfection. Typically, veneers are placed on the front of the teeth to brighten the teeth, mask discolorations, whiten teeth, and improve smiles. The cosmetic enhancements are made from materials that closely resemble the natural dental enamel’s appearance and can usually be attached to every individual tooth, or to the precise tooth that has a dental flaw. Modern technology has made dental veneers more lifelike, convenient, stronger, and to reflect light in a similar fashion as the natural dental enamel. By the close of the 1920s, the famed Hollywood dentist Dr. Charles Pincus conceived the idea of using veneers to boost the quality of smiles of actors and actresses. Initially, he applied false fronts temporarily to the teeth of Hollywood stars because he lacked the proper technology for affixing porcelain permanently to the teeth. As a result, he achieved the illustrious and trademark smile that became the mark of Hollywood beauty. Around 40 years later, Dr. Michael Bunocore etched teeth with a mild acidic solution and created an enhanced bonding surface for dental restorations and sealants, eventually ushering in the era of adhesive dentistry. In 1982, R. J. Simonsen and J. R. Calamia applied Dr. Bunocore’s methods in the application of porcelain veneers, and opened up access of the stunning Hollywood smiles to the rest of society. What Materials Are Dental Veneers Made Of? 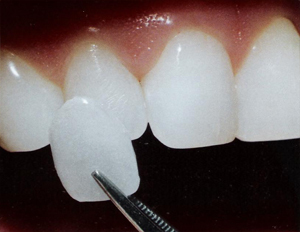 There are two predominant materials used for making dental veneers: composite resin and porcelain. Porcelain veneers are only fabricated indirectly and are usually appropriate for severe cases of dental wear, cracking, extensive chipping, dullness, uneven teeth, discolouration, and spacing. On the other hand, composite veneers are placed either directly (built-up in the mouth) fabricated by a dentist or indirectly fabricated in the laboratory by dental technicians, and are an inexpensive and minimally invasive way of restoring and correcting small cracks, chips and teeth discolouration. Moreover, the veneers can be divided into pressed, stacked and lithium disilicate veneers. The pressed ceramic veneers are made from a very strong ceramic and are typically thicker than the other types of veneers. Stacked ceramic veneers are more personalized enhancements for every patient. Lithium disilicate veneers are created using CAD/CAM technology and are very strong, being useful for severe bruxers. Veneers help to enhance the shape, colour and position of the teeth. Hence, they are invaluable in correcting chips, cracks, discoloration, minor misalignment, and gaps between the teeth. The dentist will usually choose a precise shade of composite resin or porcelain that will give the right color and improve discolored teeth or lighten up the front teeth. Similarly, veneers make chipped teeth to appear intact again because the porcelain will cover the whole of the front of the teeth with the thicker sections replacing the broken portions.Equally, the veneers close small gaps and help in dental corrections in which orthodontics (braces) are not proper. Besides, when a single tooth is out of position, the veneer can often be fitted to bring the tooth into line with the rest. Even though veneers can completely boost the person’s smile, better results are usually achieved when the patients combine the veneers with two or more cosmetic smile makeovers. The patients can request for smile makeovers during their initial veneer consultations in order to allow dentists to create single plans that contain all procedures. Dental veneers are very thin and fixed in place by a special strong bond that requires very minimal preparation of the teeth. Additionally, they make the teeth to appear natural and healthy. There are, however, a number of prerequisites before individuals can opt for the veneers. The individuals should be committed to good oral hygiene and care, have remarkable periodontal and oral health, have precise cosmetic goals and realistic expectations, and have healthy enamel that can bear the removal of thin layers during the placement of veneers. Indeed, the candidacy of an individual for dental veneers should be fully determined by a dentist who should properly evaluate dental health history, enamel condition, and immediate dental health of the patient. Stain resistance and durability: As opposed to teeth whitening procedures that require several annual touchup treatments, dental veneers offer more dramatic results that last for several years. Dental veneers are typically more lifelike than other enhancements. The veneers enhance confidence, self-assurance and happiness more than the alternative treatments. The veneer treatment process usually requires a minimum of three appointments for diagnosis, treatment planning and preparation, and actual treatment (bonding). The patient should take an active role in the entire process, understanding the corrective limitations of the procedure and directing the patients on the goals of the treatment. During the initial consultation, the dentist will analyze the patient’s oral health, perform X-rays and dental impressions, and take photographs. The patient will also explain the cosmetic goals for opting for the procedure. During the following visit, the dentist will present to the patient the treatment plan and create a mock-up of the patient’s smile. Before the veneers can be placed, the teeth will have to be prepared in order to achieve a natural look and a very strong bond between the porcelain and the teeth. The dentist will remove the enamel’s fine outer layer, removing 0.5-0.7 mm of dental material from the front of the teeth. After enamel removal, the dentist will take dental impressions of the teeth by placing soft putty into a tray and resting the tray around the teeth, or by using advanced dental software that can generate three-dimensional pictures of the patient’s mouth. Using the impressions, the veneers are fabricated for use in the treatment. If the veneer fabrication process is to take many days, the dentist can use temporary veneers to protect underlying dentin, prevent tooth sensitivity problems and cover the troubled appearance after enamel removal. Veneer fabrication is usually done by ceramists. Based on the dental impressions, the ceramists begin by building working models from which to build multiple layers of porcelain with the help of intense pressure or heat. The fabrication process is much quicker when CEREC technology (single-visit fabrication) that uses computer images, a milling system, and a 3-D printer is used. Once the veneers are fabricated, the dentist will double-check their appearance and shape, and re-shape them to perfectly suit the patient’s natural smile. Just before placing the veneers, the dentist will apply an acid gel on the teeth in order to dissolve the minerals that may cause rough microscopic surfaces. Then, the dentist will coat the teeth with a bonding agent to create a strong base for the veneers. Finally, the dentist will spread dental cement over the back of the veneers before affixing them on the front of the teeth. After the application of gentle force to fix the porcelain into place, the dentist will then use curing light in order to harden cement. After receiving the veneers, the recovery is immediate, unless the patients have opted for dental sedation and will need to wait till they recover in order to drive themselves home. Besides, due to enamel removal, the patient should avoid very cold or hot foods, and very crunchy, hard and chewy foods. Bad habits such as nail biting, ice chewing and teeth grinding must also be avoided because they can chip off the veneers. Patients must always remember that veneers are irreparable and any cracks will call for replacements. Equally, the patients should make regular visits to the dentist for regular checks. In the UK, the cost of composite veneers can vary from £150-£400 for a single tooth. While composite veneers are substantially cheaper than porcelain veneers they are more likely to become stained and generally don’t last as long. You can expect composite veneers to last between 5-8 years with proper care. Porcelain veneers cost a little more, and the price can range from £500-1000 per tooth. Despite being the more expensive option, porcelain veneers look more natural and are more durable than composites, and will typically last much longer. You can expect them to last 10-15 years with proper care, so the cost of porcelain veneers is often worthwhile. Typically, the dentist will charge for veneers on a per tooth basis. However, if you need several veneers placed at once the price per tooth usually drops – similar to buying in bulk. This will vary from practice to practice, so ask your dentist about saving by having several fitted at once. If you have a true need for veneer, meaning clinical need and not purely for cosmetic purposes, then you may get treatment from the NHS. However, before you go, it’s important that you know if your case is a clinical one or a cosmetic one. This will usually involve a consultation with your dentist to assess your case and your suitability for NHS treatment.The NHS normally charge around £200 for the treatment.